Our waterproof flooring range at Factory Direct Flooring offers a great solution for those searching for a completely waterproof floor. With our unique product our customers will have no need to worry about even the slightest bit of moisture. Browse our collection of waterproof vinyl and laminate floors below. Or read on for more information, including how to care for your waterproof floor. Waterproof flooring is available in two different forms, mainly waterproof laminate flooring or waterproof vinyl flooring. Waterproof laminate usually features a layer of durable resin, which means any water cannot penetrate the surface. This is available in a tile effect or as waterproof wood flooring in many different shades. Waterproof vinyl also features a special coating to protect it against everyday dirt, stains and scuffs. Vinyl is usually softer underfoot than laminate. However, you still have a variety of options when it comes to design. For example, waterproof vinyl flooring is available in a tile or a wood effect. Whether you opt for waterproof laminate flooring or vinyl, both types of flooring act against any spillage, moisture and even condensation. This is far more effective than water resistant laminate flooring, which may still undergo damage if the floor gets particularly wet. For this reason, this type of flooring is ideal for bathrooms, kitchens or laundry rooms, which see more moisture than any other room in the house. On top of that, waterproof flooring is well suited to commercial spaces, offices, or even children’s nurseries, which may see more spillages than homes. A waterproof floor is also the easiest type of floor to clean as you don’t need to worry about damaging your floor with excessive water, which is the case for every other type of flooring. For this reason, you can expect longevity with this type of flooring. Installing a waterproof floor is surprisingly easy, however the methods differ depending on whether you’ve opted for a waterproof vinyl flooring or waterproof laminate flooring. Vinyl flooring involves simply taping the sheet of vinyl onto the subfloor using a double sided adhesive. If the room is particularly large, glue and a trowel should do the trick. Laminate flooring involves a simple click method, clicking each slot into place without the need for glue or nails. Remember when installing laminate, to place a sheet of underlay underneath. This will help with insulation and sound-proofing the room. This type of flooring, whether laminate or vinyl, is very easy to clean. Ensure you sweep away any dust or dirt on a regular basis to avoid scratches. Then, simply use soapy water and a mop to leave a sparkling finish. 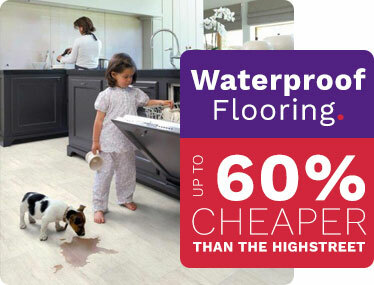 You don’t need to worry about drying your floor either, as the water won’t damage the surface. On this page you will find our wide range of waterproof flooring. Use the tabs on the left to filter by thickness, quality, brand, price and even by which room you want to put waterproof flooring in. If you have any questions about waterproof laminate flooring or waterproof vinyl flooring, please give us a call on 0330 100 00 15 and one of our experts will happily help you.